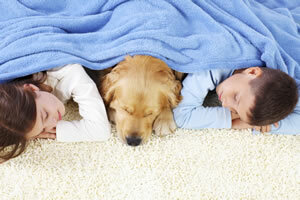 At O'Bryan's Carpet Cleaning, we offer many solutions to your pet odor problems. In any deodorization process, you must start with removing the source of the odor. O'Bryan's Carpet Cleaning's basic deodorization process is to spray down our pet deodorizer immediately following the truck mounted steam carpet cleaning process. This will alleviate most minor odor problems. You may also choose to have the problem areas located with ultraviolet light and treated with enzyme injections into the padding and sub floor. If your odor issues are more extensive, such as an animal urinating in one area extensively, O'Bryan's Carpet Cleaning offers a more comprehensive service. Our professional technicians will detach the carpet from the tack strip, pull the carpet back, and inspect the backing, pad and subfloor. 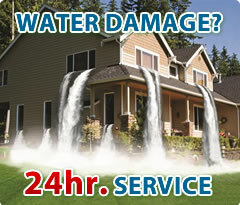 By doing this, we can fully assess the extent of the damage. We offer a comprehensive deodorization process that includes removing all contaminated padding and replacing it with new padding that contains a pet barrier. Next, we clean and seal the subflooring in the worst areas. We then reinstall the carpet, pretreat it, and clean it using our truck mounted steam cleaning process. There may be some situations where the carpet is unsalvageable. At O'Bryan's Carpet Cleaning, you can rely on our professional technicians to honestly assess your situation and not sell you unnecessary services that you don't need. O'Bryan's Carpet Cleaning can work within your budget to offer the best possible deodorization procedure! Based in Denton, Texas, O'Bryan's is your best source for pet odor removal in Denton, carpet cleaning in Lewisville, carpet cleaning in Flower Mound, carpet cleaning in Argyle, carpet cleaning in Highland Village, carpet cleaning in Copper Canyon, carpet cleaning in Bartonville, carpet cleaning in Lake Dallas, carpet cleaning in Hickory Creek, carpet cleaning in Little Elm, carpet cleaning in Corinth, carpet cleaning in Oak Point, carpet cleaning in Crossroads, carpet cleaning in Aubrey, carpet cleaning in Krugerville, carpet cleaning in Pilot Point, carpet cleaning in Providence Village, carpet cleaning in Sanger, carpet cleaning in Krum, carpet cleaning in Ponder, carpet cleaning in Justin, carpet cleaning in Lantana, carpet cleaning in Robson Ranch, carpet cleaning in Shady Shores, carpet cleaning in Trophy Club, carpet cleaning in Northlake, carpet cleaning in Roanoke, carpet cleaning in Bolivar, carpet cleaning in Paloma Creek, carpet cleaning in Savannah.